The amount of online shopping we do is continuously rising, and is known to sky rocket before, during and after the Christmas period. Luckily for e-commerce websites, this Christmas will be no exception, with online shoppers forecasted to spend billions online. Your e-commerce site is extremely likely to see a surge in traffic during the festive period, and there are many steps you can take to take advantage of this and even attract more visitors. Having a successful Christmas can be vital for your website, winning you customers and sales. 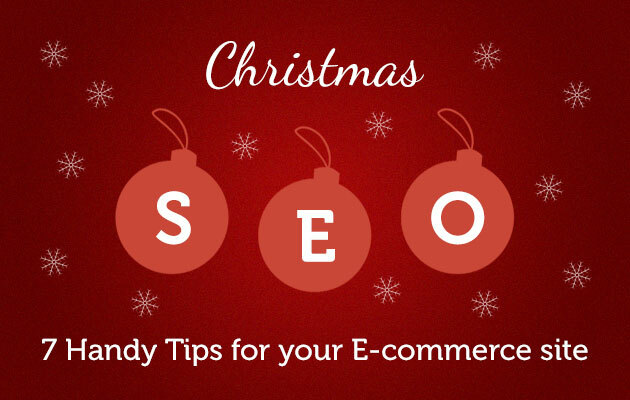 By following these 7 Christmas SEO tips you can ensure that your website makes the most of online users and maximises its potential around this time. UK shoppers are expected to spend more than £74bn this Christmas, with a huge 23% – £17.4bn – of that being online. And with the growing importance of mobile search and more and more of us using mobile phones and tablets to search and shop, it is essential to have a website that is fully responsive across all devices. You need to make sure that your website is ready to handle the influx of extra traffic over Christmas, as shoppers will look to your competitors instead if your website is slow to load or difficult to use. Identify pages with crawl problems, such as 404s / broken links and get them fixed as soon as possible. You can use Webmaster Tools to check for any obvious issues with your site. Make sure your site is easy to navigate and that your ‘add to cart’ and ‘check-out’ functions are working efficiently and are simple to use. Ask yourself – what words will my target customers use to search for their desired products / services over the Christmas period?? Find out exactly what keywords your target audience is using, then you can target these in your SEO, social media and content marketing campaigns. A useful tool is Google Adwords to find out which keywords are being searched the most. Review your category and product pages based on keyword research – find out what your best sellers are and target these products. To help you make the most over Christmas, identify trends in your market. What items are your customers most likely to be searching during this period? You can use a useful tool such as Google Trends to help you discover what your customers are looking for and base offers around these. Special Christmas offers can be used as a great marketing tool across all campaigns, and will attract visitors to your website. Look at previous sales figures to help you decide what items you could be offering over the Christmas period. Create some Christmas-themed landing pages to really target your keywords and attract customers. Customers will be attracted to festive designs and Xmas-themed offers. Find out more about why targeted landing pages could be essential to your Christmas marketing campaign. You can also treat your site to some festive banners or images to get your online shoppers in the Christmas spirit. Integrate your Christmas SEO with your social media and online PR campaigns to make sure your site is getting as much exposure as possible. Study your competition to see what is working for them – they might be able to indirectly give you some handy tips! If you need any help tidying up your website or with your digital marketing strategy, please don’t hesitate to get in touch today.